You are here: Home › Conservation › Primers and Grounds › Surface Preparation › Surface Checking and Plywood, Is It a Concern? What could be more important to the longevity of a painting than the proper selection and preparation of the substrate you are working on? Having a vested interest in the success of artists using our products, we want to highlight some of the concerns coming from the field of conservation regarding surface checking and the use of plywood as a fine-art material. We will offer some possible explanations for this phenomenon and some suggestions to help mitigate the effect of surface checking. First, however, we will start with some background on how plywood is manufactured to provide a little context. When referring to plywood, we mean engineered wood products constructed by cross-laminating and adhering veneer or thin slices of wood together under heat with pressure using strong adhesives. The main advantage of this construction, at least for painting supports, is its dimensional stability and resistance to movement when exposed to changes in moisture and humidity. The cross-laminated structure imposes a ‘forced stability’, in a sense, and while this results in desirable structural attributes, it is also the cause of many of the concerns surrounding plywood. Illustration of Rotary Lathe Cutting, Shear Force and resulting Lathe Checks. Checking characteristically follows the grain of the wood. Most plywood veneer is created through rotary lathe cutting, a process where a log is softened by either boiling or steaming and then is fixed and balanced on a lathe where thin slices of veneer are peeled off in a spiral by a fixed skimming knife as the log rotates. As the knife enters the wood and separates the veneer from the log, it is bent tangentially under tremendous shearing forces. The stresses resulting from this can exceed the strength of the wood, causing failure in the form of lathe checks. The term ‘checks’, when talking about wood, refers to cracks or splits in the wood’s surface. Any stresses from this process are then retained in the plywood as the veneer is laid flat, bonded together and restrained with an adhesive. The adhesives themselves offer increased resistance to moisture resulting in improved dimensional stability, but wood is still hygroscopic (or ‘water loving’) and wants to exchange moisture with its environment. (Minor, M. 1993) As these fluctuations occur, or are introduced as a byproduct of water-based paints or grounds, it causes swelling and shrinking in the restrained wood. This fluctuation can create enough tension to overcome the resistance of the plywood to splitting, known as its tensile strength. As the natural tendency for wood is to find the easiest method to relieve this stress, these lathe checks, being a weakness in the veneer, may open up and cause larger surface checks running along the grain of the wood. If the extent of the checking overcomes the flexibility of the ground layers, they may become visible as small cracks and telegraph through subsequent layers of paint. Unfortunately, there is not much that can be done to patch up checking once it occurs. There is a risk that any attempt to fill these cracks could add additional stress to the wood. (Minor, M. 1993) Additional layers of paint intended to cover the cracking would also be susceptible to future cracking and there is no evidence in our research that finishes will have an impact on the formation of surface checking aside from perhaps slowing it down. (Leavingood, S., Funck, J. W., Reeb, J. E., 2011) Attempts to further restrain the plywood with the addition of cradling could retain even more stress in the wood thereby exacerbating risks. 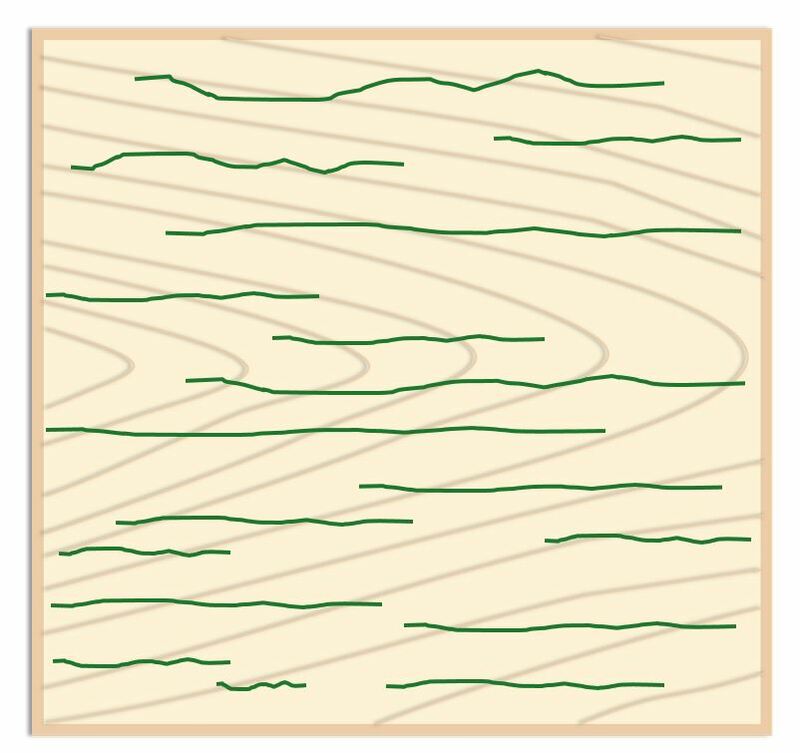 As checking is tied to an intrinsic process in the manufacturing of all plywood, even high grades of plywood could exhibit surface checking. Side by side comparison of two outdoor testing panels. Medium Density Overlay (MDO) is on the left and Plywood on the right. Both panels were prepared in the same manner and exposed to the elements in the same outdoor testing conditions. Evidence of surface checking is visible on the plywood panel. While outdoor testing is by far more rigorous as a test than most typical painting scenarios, it is an informative test and effective means of finding any potential weaknesses. Over time, as our research advances and we develop a greater dialogue with artists and conservators, we will often need to reevaluate past recommendations in light of new evidence. This is one such case and, as we learn and update our advice, we want to share that knowledge in the hopes that it may serve to inform artists of potential risks to the longevity of their works. 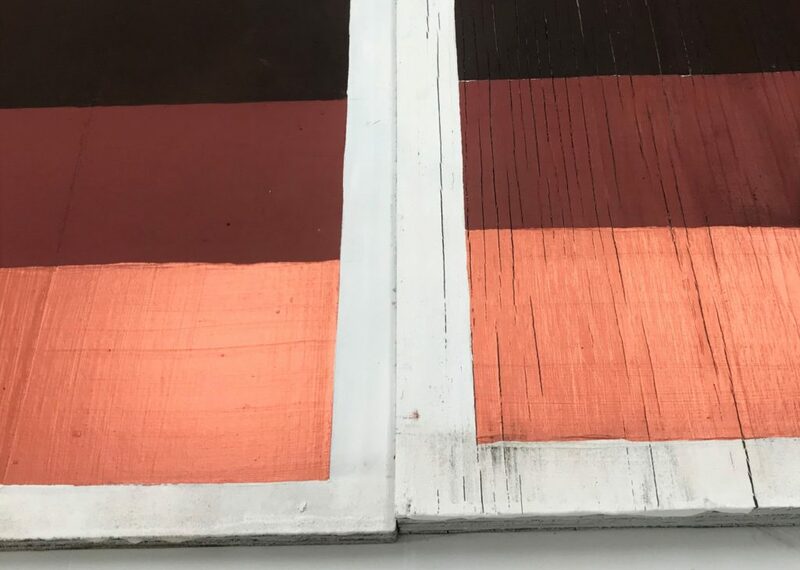 If you have any questions or comments about this article or any other paint related topic, please feel free to contact our Materials Application Department at help@goldenpaints.com or by calling 800-959-6543. College of Forestry, Oregon State University. (2018) Maple Veneer Checking Research. Retrieved from: http://owic.oregonstate.edu/maple-veneer Accessed on March 11, 2019. Forbes, C. (1997) Understanding and Minimizing Veneer Checking on Furniture Panels. NC State Extension Publications. Accessed on March 11, 2019. Minor, M. (1993) The Nature and Origin of Surface Veneer Checking in Plywood. Department of Objects Conservation, The Metropolitan Museum of Art, New York, N.Y.
Tremblay, C. Bouffard, J. F. (2012) Study on the Issue of Veneer Cracking in the Kitchen Cabinet and Furniture Industry. Natural Resources Canada, Forestry Canada and Economic Development Canada. Value to Wood Report FPI-11-01. Project No. 201005269. 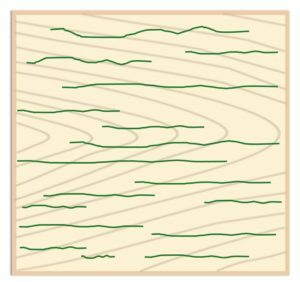 4 Responses to Surface Checking and Plywood, Is It a Concern? In my ten year experience as a painter I’ve almost abandoned wood for portrait sized paintings, it always cracks. In the past quarter sawn oak was used and if you can afford it then it still may be a great solution to avoid cracking. For larger paintings I use canvas with all its problems :-(. I’ve replaced the wood with aluminium panels, I glue them to marine ply, I find this surface, easy to prepare, super smooth to paint on and really stable, I believe from my research that it is archival. I would never have believed it until I tried it and I recommend it to anyone looking to try something to solve the problem of wanting an archival surface. We hope this is helpful and if you have more questions, feel free to contact us at help@goldenpaints.com. Thanks Scott, this is was very informative, and also disconcerting. I’ve been using plywood panels for years, thinking I’ve got all my bases covered. I had always assumed that two generous coatings of GAC100, followed by Gesso, would shield the plywood from environmental stresses… But your research casts doubt on plywood’s structural integrity. I live in a country where our summers are scorching dry, and our winters are soaking wet. I’m guessing that these fluctuations will only aggravate the plywood’s habit of checking. I guess it’s time to bring on the aluminium panels…. As you mentioned in your comment, fluctuations in the relative humidity of the environment plays a key role in whether or not the plywood will develop surface checks. If the painting remained within a particular relative humidity range for its lifespan, it may not develop surface checking. We do want to mention that acrylics or even varnishes do not act as good vapor barriers. While your method of preparation may help block Support Induced Discoloration (SID) or even block oil penetration into the plywood, the piece will still be very much influenced by its environment.